TATTON at Burke Mountain is a collection of Georgian-inspired parkside rowhomes, and single-family homes. Located adjacent Leigh Elementary and Victoria Park, PHASE 1 of the 3 and 4 bedroom rowhomes are ideally located for a growing family. With lots of storage, open floorplans and generous sized rooms, the Tatton Row Homes are timeless in design and offer many standard features. PHASE 1 of Tatton Single-family homes is located along Darwin Avenue at Soball Street. These eleven single-family homes are located conveniently close to Leigh Elementary School and Victoria Park. They will be surrounded by a network of walking trails at the foot of Burke Mountain, yet, be conveniently located close to transit and commuting corridors. Exterior finishings will alternate stone, stained cedar shingle and brick, to give this elegant neighbourhood a timeless feel. 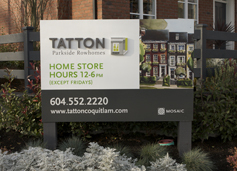 PHASE I and PHASE II of Tatton Single-family Rowhomes and Single-family Homes at Burke Mountain are now SOLD OUT. Tatton Row Home - Plan A – 4 bedroom + Flex Room, 1,938 sq.ft. Tatton Row Home - Plan B – 4 bedroom + Flex Room, 2,213 sq.ft. Tatton Row Home - Plan C – 3 bedroom, 1,733 – 1,749 sq.ft. Tatton Row Home - Plan D – 3 bedroom, 1,372 – 1,374 sq.ft. Tatton Row Home - Plan E – 3 bedroom + Loft, 1,843 sq.ft. Tatton Row Home - Plan F – 3 bedroom + Loft, 2,028 sq.ft. Tatton Row Home - Plan G – 3 bedroom, 1,453 sq.ft. Tatton Row Home - Plan H – 4 bedroom, 1,757 sq.ft. Tatton Single Family Homes - Gallery Plan - 3 bedroom (with optional 4th), 2,783 sq.ft. 3 & 4 bedroom Parkside Row Homes.